Lake Tahoe is located on the border between California and Nevada, about 200 miles east of San Francisco and 30 miles west of Reno, Nevada. Before you figure out how to get to Lake Tahoe, you need to know what part of the lake you're going to. 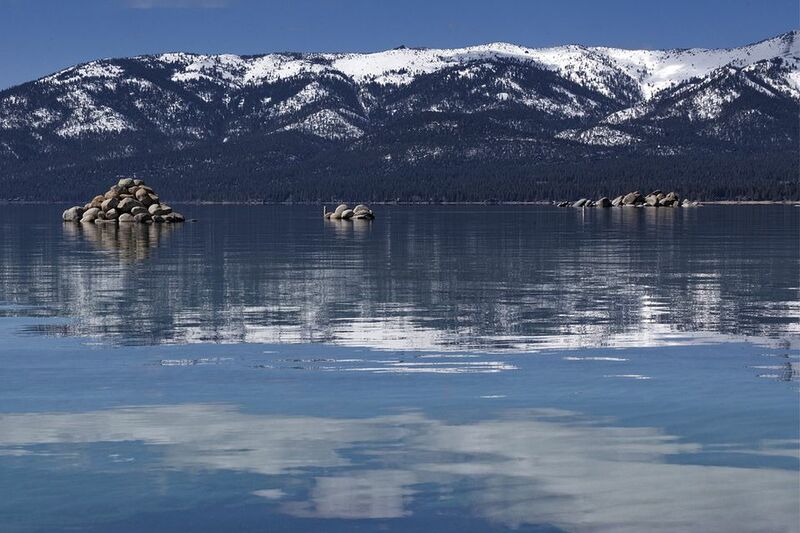 Lake Tahoe is a lot bigger than most people think and can be tricky for first-time visitors. If you drive all the way around the lake, it's 72 miles and takes about two hours. Descriptions of the lake's areas can be confusing and may seem to defy logic. The state border between California and Nevada runs north and south, so you might think it would be East and West Tahoe or California Tahoe and Nevada Tahoe. In fact, people usually talk about North and South Lake Tahoe instead. North Lake Tahoe is mostly in California. It's less developed than the south shore and close to Northstar and Squaw Valley ski resorts. Beer-lovers will want to explore the the North Lake Tahoe Ale Trail for seasonal brews and pints. If you want to hit the beach, try some of the hidden sandy spots at Secret Cove, Skunk Harbor, or Chimney Beach (the most popular of the three). South Lake Tahoe is partly in each state, with gambling casinos concentrated on the Nevada side of the border. It has more hotels, shops, and restaurants than North Lake Tahoe, but is also close to several ski resorts. Occasionally, someone gets confused by the state line markers on the map and thinks that long line drawn through the lake is a bridge. Don't let that happen to you. For a bird's-eye view of the lake, take the Heavenly Mountain's scenic gondola or head to Emerald Bay State Park for a gorgeous sunset view and a tour of Vikingsholm Castle. If you're into rides, the Heavenly Mountain Coaster plummets through the pines and Heavenly’s Epic Discovery area has high-rope courses, zip lines, and a climbing wall for families. If you're feeling a shopping spree, check out The Crossing, The Village Center, the Chateau at the Village, and Heavenly Village, which all have bespoke boutiques, chic wine bars, and live music venues. You can find many routes from San Francisco to Lake Tahoe. It's about 200 miles from downtown San Francisco to Incline Village, Nevada on the north shore and approximately 190 miles to South Lake Tahoe, California at the lake's southernmost point. Most drivers use I-80 or US Hwy 50 to get to Lake Tahoe from San Francisco, and either of them will provide lots of excellent views. Once you get to Tahoe, you need to know how to get around Lake Tahoe. Use this Lake Tahoe driving tour to get a good overview of what you can see and do around the lake. Going in summer? Take a look at these tips for your perfect Lake Tahoe summer.